Our pre-school room is the largest in the nursery and it is fully resourced with plenty of equipment to enhance every child’s interests, whilst simultaneously stimulating their development. There is a ratio of eight children to one adult and we are registered to care for 32 children per session. Like the Bluebell and Poppy Rooms, there are many areas of play including a Creative area, Maths area, Malleable area, Role Play area, Home Corner, ICT and a Quiet area. Children have free-flow play at various times of the day where they are able to select resources to explore and play with. At other times of the day there are more structured activities that are implemented by members of staff to ensure every child’s development needs are consistently met. This may be practising the phonetic alphabet or developing writing or literacy skills. It also ensures that staff have time to create a good working relationship with the children (particularly key children) so that they are happy and feel at ease at all times. Sunflowers also have access to the large soft surface play area which is shared with the Poppy Room, this encourages children to form relationships with different children of a similar age range and gives siblings a chance to interact too. There is a partially covered area for continued play even when the weather is not permitting. 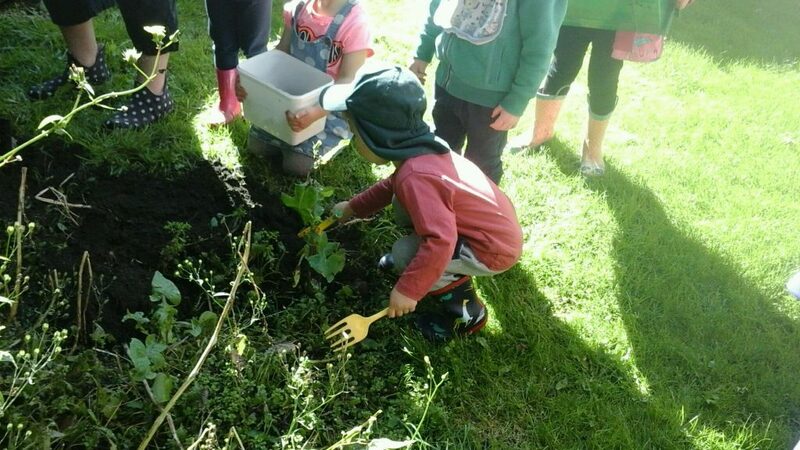 Sunflowers also have access a re-landscaped field which includes a wooden rope bridge, large sand pit area and musical windpipe features, as well as a designated area for the children to grow fruit & veg.